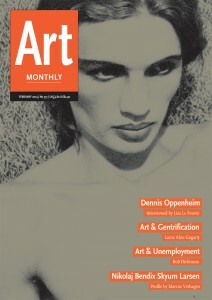 Bob Dickinson discusses his feature from Art Monthly February 2014 on art and unemployment and his reviews of related exhibitions at Tate Liverpool, Castlefield Gallery and Untitled Gallery Manchester. The representation of the jobless in art shifted dramatically in the 20th century as industrialisation brought with it mass protests in public spaces against the conditions of the unemployed. But how have artists such as LaToya Ruby Frazier, Richard Shields and the Bite Back Movement portrayed the increasingly invisible unemployed of our current post-industrial world? This entry was posted in Art Monthly Monthly and tagged 1793, 2012, Adeptness Indebted 2010-12, Art Turning Left at Tate Liverpool, Bill Brandt, Bite Back Movement, Bite Back Movement A Dangerous Figure Somerset House London, Bite Back Movement’s morphing Figure, castlefield gallery manchester, Deb Covell, Dorothea Lange, Dorothea Lange Migrant Mother of 1936, Francis Owens Thompson, Jacques-Louis David’s painting, Kazimir Malevich, Latoya Ruby Frazier, Levi’s Go Forth advertising campaign, Nikolaj Bendix Skyum Larsen, Oscar Nemon, Pil & Galia Kollectiv, radical conservatism, Radical Conservatism at Manchester’s Castlefield Gallery, Richard Shields, Richard Shields Adeptness Indebted 2010-12, The Arrival of the Jarrow Marchers in London Viewed From an Interior 1936, The Death of Marat, Thomas Cantrell Dugdale, Thomas Cantrell Dugdale The Arrival of the Jarrow Marchers in London Viewed From an Interior 1936, Yannis Behrakis on February 19, 2014 by artmonthly.